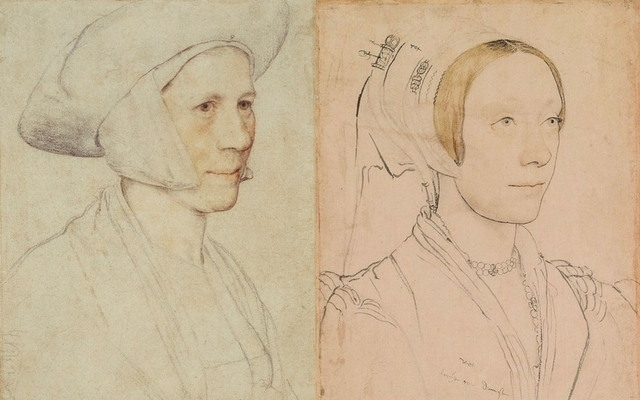 The following are portrait sketches believed to be by Hans Holbein the Younger that are in the Royal Collection. 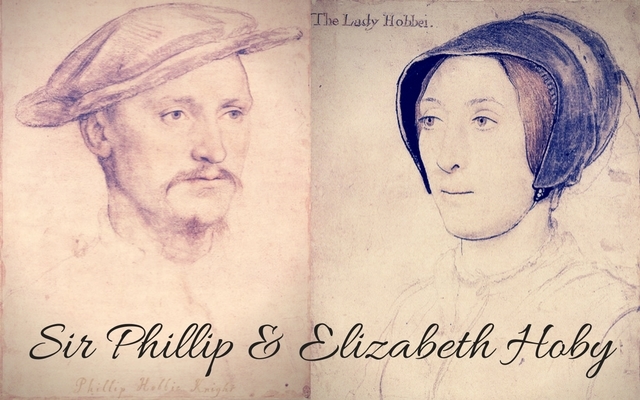 Holbein is one of the most well known artist of his time, especially in Tudor England. His portraits are some of the best of the best. The details are amazing and truly admirable. 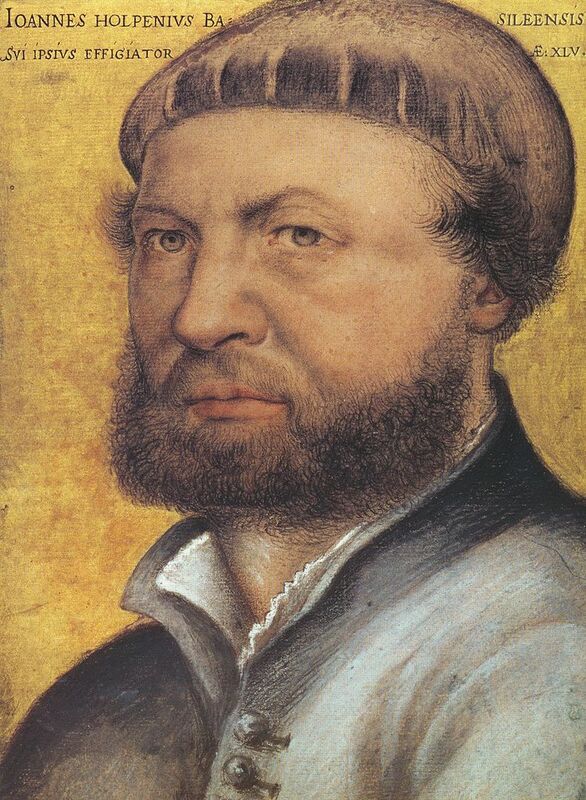 Holbein was born in Augsburg in southern Germany in the winter of 1497-8. 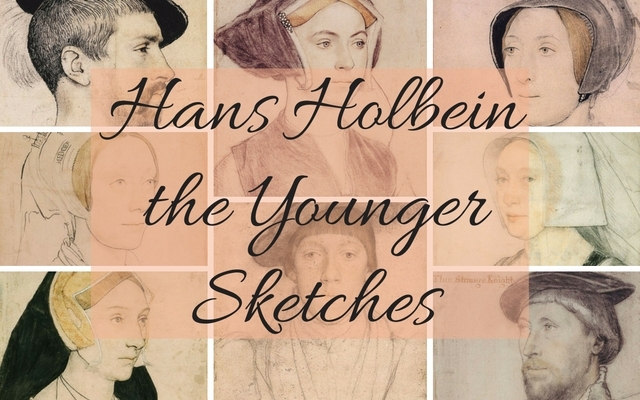 He was taught by his father, Hans Holbein the Elder. He became a member of the Basel artists’ guild in 1519. He travelled a great deal, and is recorded in Lucerne, northern Italy and France. In these years he produced woodcuts and fresco designs as well as panel paintings. With the spread of the Reformation in Northern Europe the demand for religious images declined and artists sought alternative work. Holbein first travelled to England in 1526 with a recommendation to Thomas More from the scholar Erasmus. In 1532 he settled in England, dying of the plague in London in 1543. 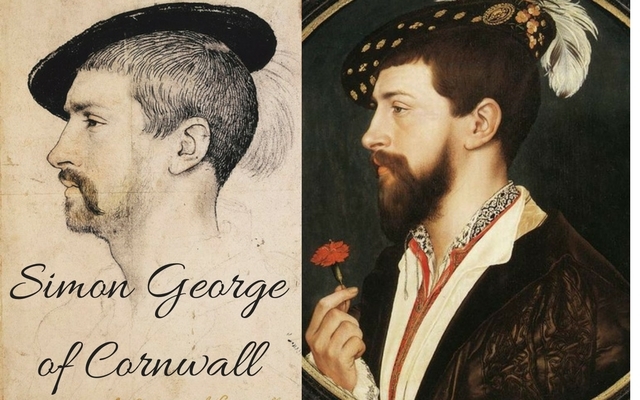 The English nobleman Simon George used this painting (on right) to ask the hand of a young lady befitting his social status in marriage: the red carnation was the traditional symbol of such a request. 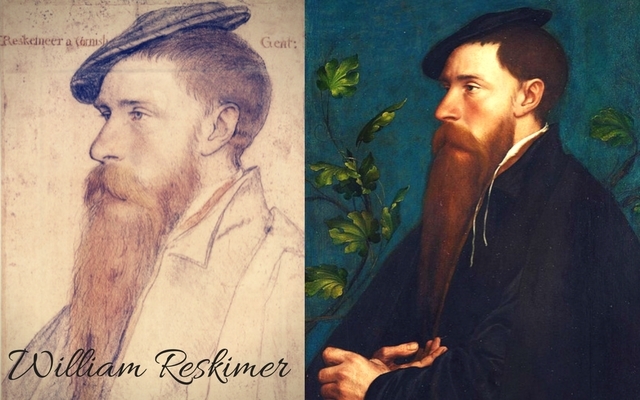 Reskemeer a Cornish Gentleman – William Reskimer (d.1552), who came from Cornwall, as the later inscription on the drawing records, held a number of minor positions at Henry VIII’s court, among them Page of the Chamber. In 1543 he was granted keepership of the ports of the Duchy of Cornwall and in 1546 was appointed Gentleman Usher. A portrait drawing of Elizabeth, Lady Audley (d.1564), second wife of Thomas, Lord Audley of Walden, and daughter of Thomas Grey, 2nd Marquis of Dorset. 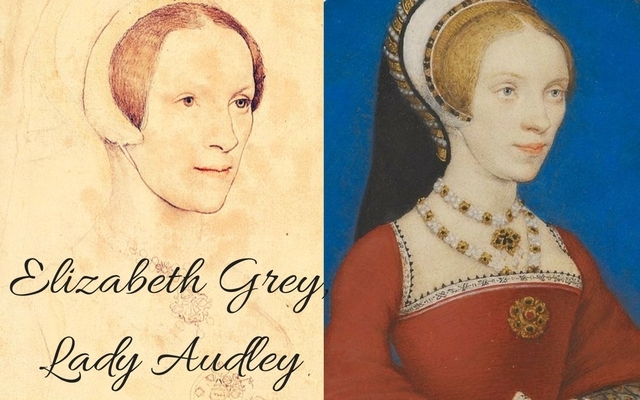 Elizabeth married Thomas Audley, 1st Baron Audley of Walden sometime between 1538 and 1540 – she was his second wife. About 1540 Elizabeth gave birth to their first child, a daughter, Margaret Audley. A portrait drawing of Margaret, Lady Elyot (c.1500-1560), daughter of Sir Maurice à Barrow, and wife of Sir Thomas Elyot. The portrait shows her head and shoulders facing three-quarters to the right. She wears a yellow gable headdress and pendant. A portrait drawing of Sir Thomas Elyot (c.1490-1546). A bust length portrait facing three-quarters to the left. He wears a hat and fur collar. 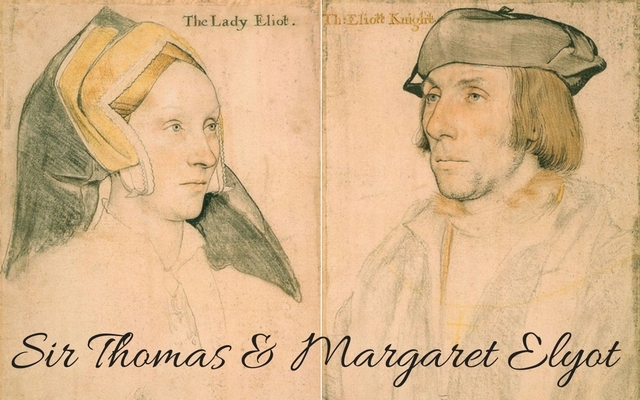 Sir Thomas Elyot (c.1490-1546) was a writer and diplomat, and was well respected by his contemporaries in both fields. His most famous publication was The Boke named the Governour, a book of political instruction inspired by classical literature, which was first issued in 1531 and was reprinted a number of times. He also published a comprehensive Latin-English dictionary, and a popular guide to medicine. His work as ambassador to Charles V took him to the continent, where he visited the city of Nuremberg four years after Dürer’s death. Holbein’s portrait was probably made after Elyot returned from this embassy, on which he had been replaced as ambassador by Thomas Cranmer. Holbein has shown Elyot dressed in a cap and gown with a fur collar, over which he wears a cross on a long chain. A portrait drawing of Elizabeth, Lady Hoby (c.1500-1560), wife of Sir Philip Hoby, and daughter of Sir Walter Stonor; she was a member of Queen Katherine Parr’s circle. A portrait drawing of Sir Philip Hoby (1504/5-1558). 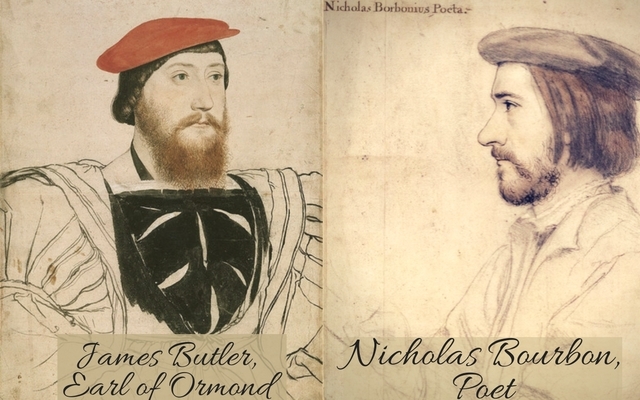 A portrait drawing of James Bulter (c.1496-1546), who became the 9th Earl of Ormond and the 2nd Earl of Ossory after this drawing was made. This drawing was previously identified as Thomas Boleyn, Earl of Wiltshire, the father of Anne Boleyn. 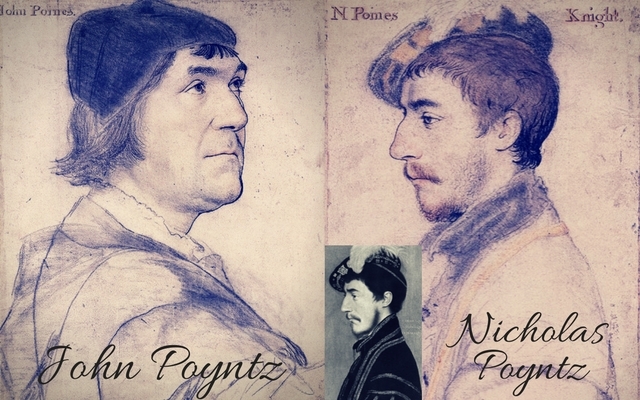 A portrait drawing of Nicholas Bourbon (c.1503-1549/50), a French poet at the court of Henry VIII. Bourbon came to England in 1535 and became part of a circle of foreigners at Henry VIII’s court which included Holbein and the astronomer Nicholas Kratzer. 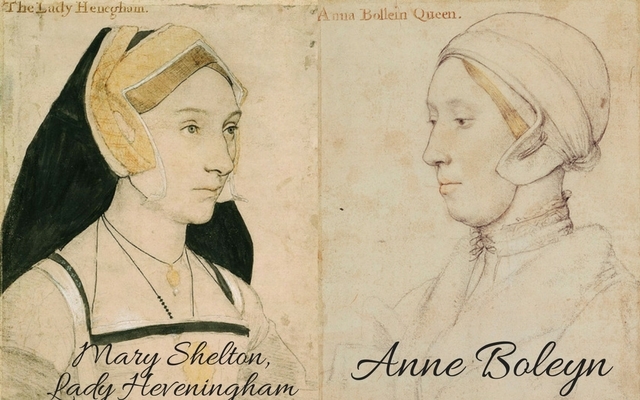 Bourbon praised Holbein’s work as exceeding that of Apelles, the legendary Greek painter. 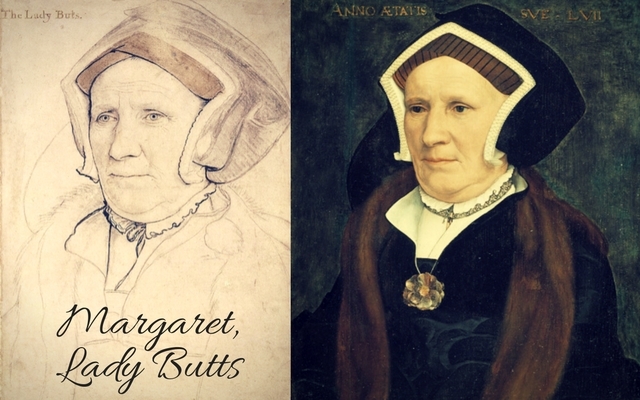 A portrait drawing of Margaret, Lady Butts (c.1485-1545), wife of Sir William Butts, and daughter of John Bacon. She served as a lady-in-waiting to Princess Mary and belonged to the circle of Queen Katherine Parr. 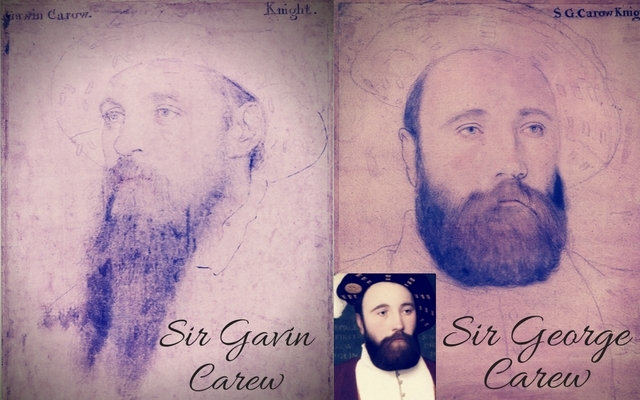 A portrait drawing of Sir Gavin Carew, brother of Sir George Carew. A portrait drawing of Sir George Carew (c.1504-1545), commander of the Mary Rose. A portrait drawing of Edward Fiennes de Clinton, 9th Lord Clinton, 1st Earl of Lincoln (1512-1585). A portrait drawing of Lady Lister, her precise identity is unknown. The precise identity of the sitter is unknown. One suggestion is Lady Jane Lister, the wife of Sir Richard Lyster, Lord Chief Justice. c. 1532- c. 1543; Female sitter believed to be Lady Jane Lister. A portrait drawing of Sir Henry Guildford (1489-1532). 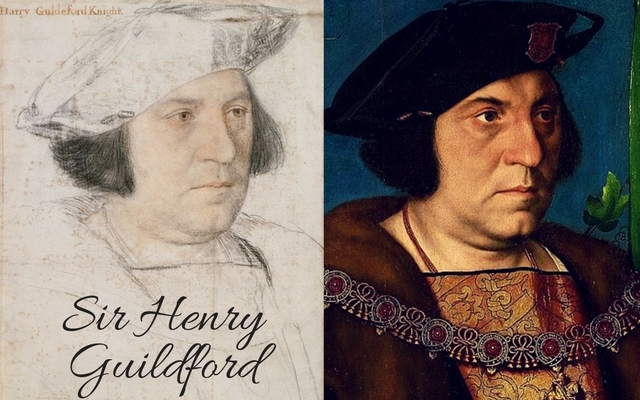 Sir Henry Guildford (1489-1532) was one of Henry VIII’s closest friends. On the King’s accession in 1509 he was appointed Esquire of the Body – a personal attendant on the King – and Master of Revels, responsible for organising the lavish entertainments at court. His parties included morris dancers, moving stages and a series of elaborate costumes for the young King. 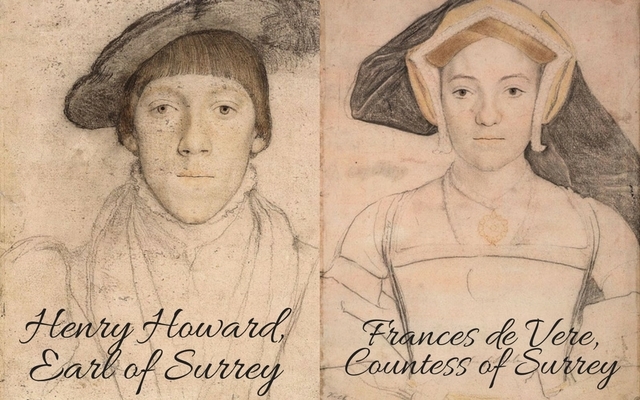 Guildford’s influence at court was cut short in the 1519 purge of the so-called ‘minions’, an attempt by older statesmen to limit the influence of hot-headed young men on the 28-year-old monarch. Guildford soon returned to court, however, and developed a distinguished career as Comptroller of the Royal Household. A portrait drawing of John Poyntz of Alderley, Gloucestershire (c.1485-1544). 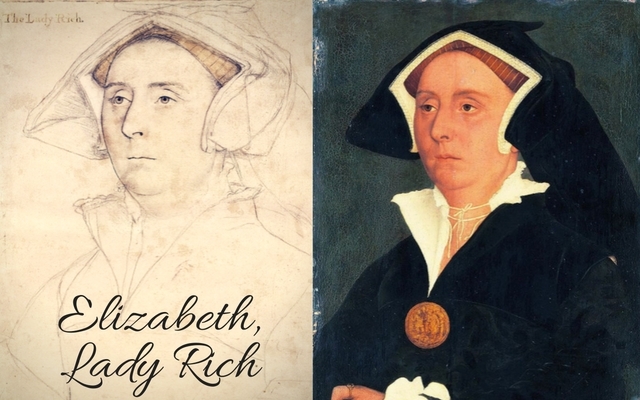 A portrait drawing of Elizabeth, Lady Rich (d.1558), wife of Richard, 1st Baron Rich, daughter of William Jenks. A portrait drawing of Thomas, 2nd Baron Vaux (1509-1556). The Lord Vaux. Thomas, 2nd Baron Vaux of Harrowden, succeeded to the title in 1523. In 1532 he travelled to France as a member of Henry VIII’s embassy to meet the French King, and in the same year was made a Knight of the Bath. Vaux was the author of elegiac and melancholy poetry, which was published posthumously in various anthologies. He died from the plague in October 1556. A portrait drawing of Elizabeth, Lady Vaux (1509-1556), wife of Thomas, 2nd Baron Vaux, and daughter of Sir Thomas Cheney. The Lady Vaux. 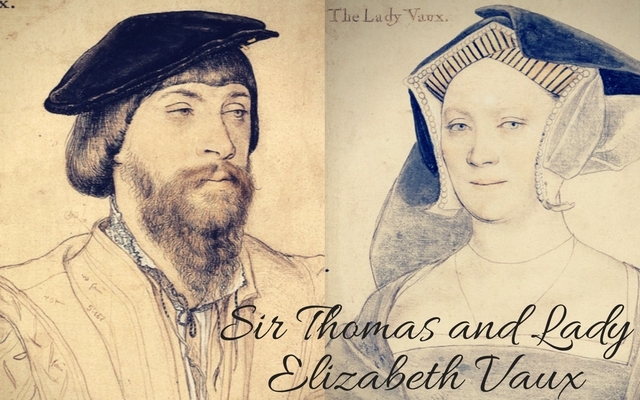 Elizabeth Vaux was born in 1509, the daughter of Sir Thomas Cheney, an Esquire of the Body to Henry VIII. She became a ward of the 1st Baron Vaux in 1516 and was married to his son Thomas (later 2nd Baron Vaux of Harrowden) before May 1523. 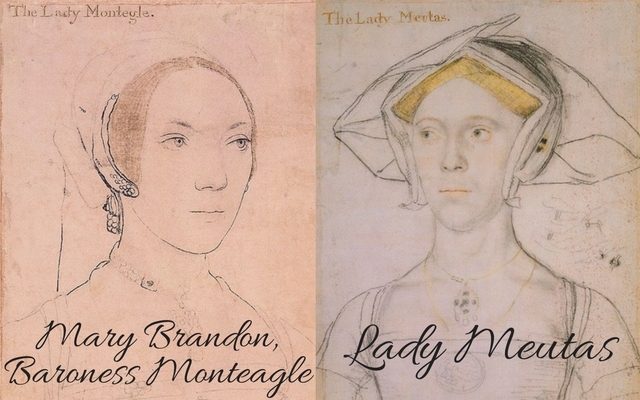 A portrait drawing of Mary, Lady Monteagle (1510-before 1544), married to Thomas Stanley, 2nd Lord Monteagle, and daughter of Charles Brandon, 1st Duke of Suffolk. She wears a necklace with a jewelled letter ‘M’ pendant, and a medallion. A portrait drawing of Joan, Lady Meutas (d.1577), wife of Sir Peter Meutas. She wears a headdress, necklace, and pendant. A portrait drawing of Lady Ratcliffe. She wears a chain and pendant. Inscribed by the artist: damast black, and schwarz felbat (black velvet). 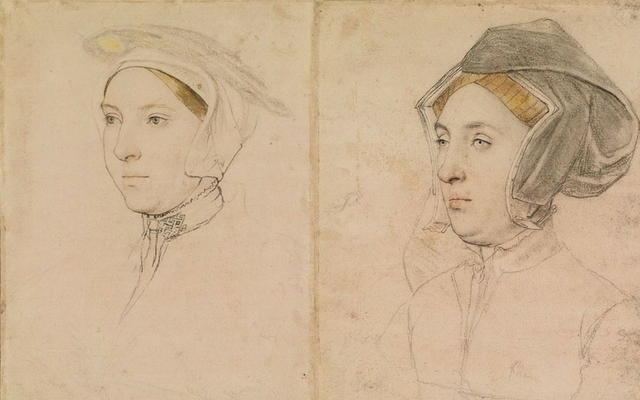 Holbein’s drawings are an important source of information for the dress at the court during of Henry VIII. This lady wears a distinctive headdress with a hood lifted up on one side. 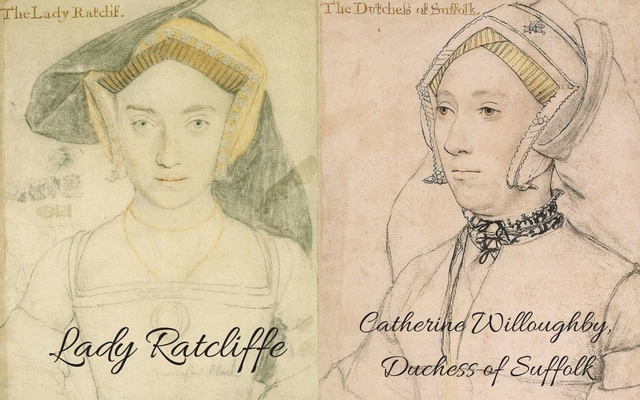 A portrait drawing of Katherine, Duchess of Suffolk (1519-1580), fourth wife of Charles Brandon, Duke of Suffolk. A portrait drawing of Sir Thomas Lestrange (c.1490-1545). Sir Thomas Lestrange was an important courtier, holding the post of Squire of the Body (an attendant of the king) in the early years of Henry VIII’s reign. In the 1530s, he retired to his native Norfolk, where he earned a prosperous living from sheep farming. 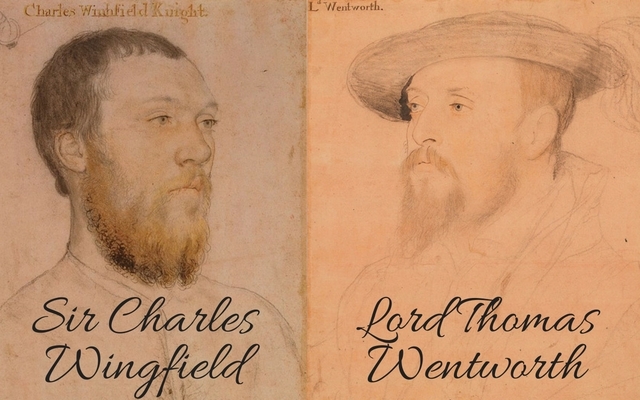 A portrait drawing of Sir Charles Wingfield (1513-1540). He wears a medallion on a ribbon against his bare chest. In the upper left corner is a sketch of a wrist with a bracelet containing a ring. A portrait drawing of Thomas, 1st Baron Wentworth (1501-1551). A portrait drawing of Sir Thomas Wyatt (c.1503-1542), a poet who served at the court of Henry VIII. A portrait drawing of John Fisher, Bishop of Rochester (c.1469-1535), who became a cardinal in 1535 and was martyred by Henry VIII. The Bishop of Rochester [whose] head was cut [off in] the year 1535). 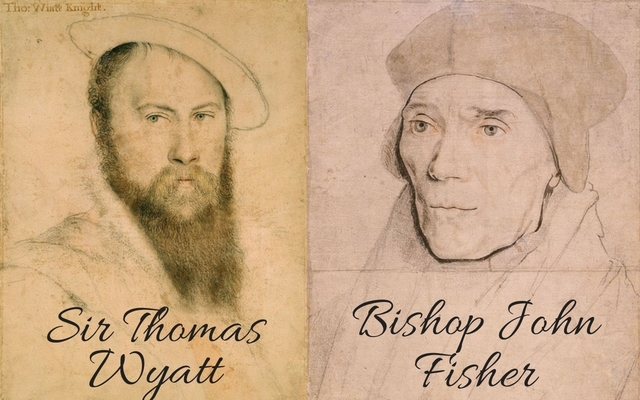 John Fisher was appointed Bishop of Rochester in 1504. He was a friend and correspondent of Erasmus, who praised his humility and learning. 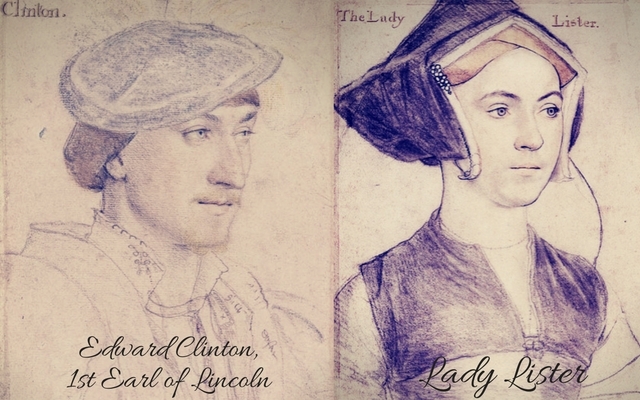 Fisher was not afraid to declare his beliefs publicly, and became a vocal supporter of Katherine of Aragon during the arguments over the royal divorce. His opposition to the King led to his execution for high treason in 1535, shortly after he had been made Cardinal. A portrait drawing of Mary, Lady Heveningham (1510/15-1570/71), wife of Sir Anthony Heveningham, daughter of Sir John Shelton, and cousin of Queen Anne Boleyn. 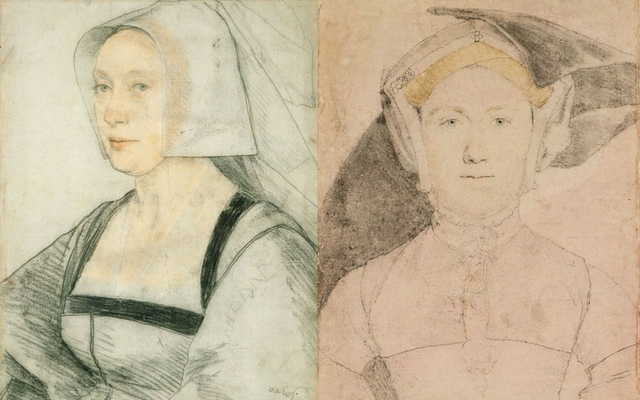 A portrait drawing of a woman traditionally believed to be Anne Boleyn (c.1500-1536), second wife of Henry VIII and mother of Elizabeth I. She wears an informal nightgown lined with fur (possibly the ‘black satin nightgown’ given by Henry to Anne during their courtship), and a linen undercap shaped with wire over the ears and held in place by a band of linen tied at the back. By 1526 the King had fallen in love with Anne Boleyn and after divorcing Katherine of Aragon married Anne in 1533, shortly before the birth of their daughter, Elizabeth. Anne was clever and cultured, but failed to provide Henry with the son he needed. She was charged with adultery and was executed for treason in May 1536. On the verso of the sheet is a sketch of the coat of arms of the Wyatt family and other heraldic studies. A portrait drawing of Henry Howard, Earl of Surrey (1516/17-1547).He wears a hat with a feather and a high neck shirt. Henry Howard was the childhood companion of Henry VIII’s illegitimate son, Henry Fitzroy, and is today best remembered as the poet who introduced blank verse into English literature. 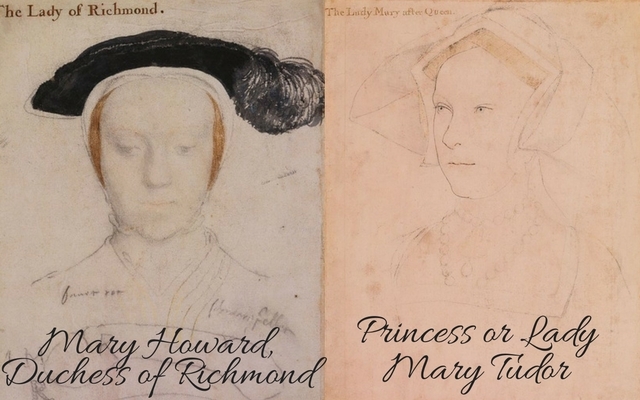 Several painted portraits survive of Howard by Holbein, but none adopt this striking frontal pose. A portrait drawing of Frances, Countess of Surrey (1517-1577), wife of Henry Howard, Earl of Surrey, and daughter of John, 15th Earl of Oxford. 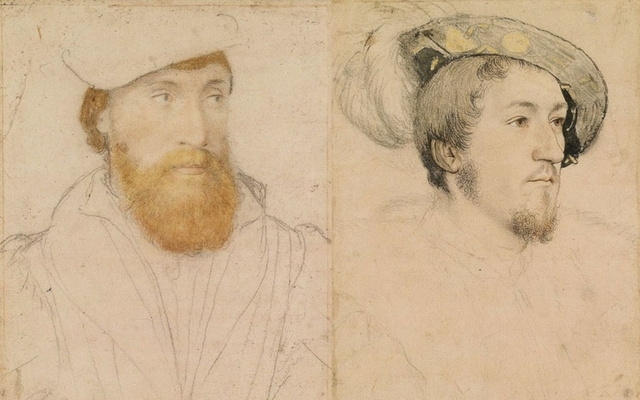 Frances de Vere married Henry Howard in 1532, and it is possible that these this drawing along with a companion piece of her husband (RL 12215) were made at that time, in preparation for painted portraits. A portrait drawing of Mary, Duchess of Richmond and Somerset (c.1519-c.1555), the daughter of Thomas, 3rd Duke of Norfolk and sister of Henry Howard, Earl of Surrey. She was married to Henry Fitzroy, Duke of Richmond and Somerset, the illegitimate son of Henry VIII. The portrait shows the head and shoulders facing the front with downturned eyes. She wears a hat with a feather. A portrait drawing of Princess Mary (1516-1558), later Queen Mary I, daughter of Henry VIII and Katherine of Aragon. She wears a pearl necklace and pendant. Mary Tudor was marginalised after her parents’ divorce. Although unpopular with Anne Boleyn, she was welcomed back to court by Jane Seymour and became particularly close to her father’s last wife, Katherine Parr. On Henry’s death, she supported the accession of her brother, but became a vocal opponent of Edward VI’s advisers when they instituted religious reform. Mary inherited the throne in 1553 after overthrowing her rival, Lady Jane Grey. The identities are these women are unknown. The identities of these women is unknown. 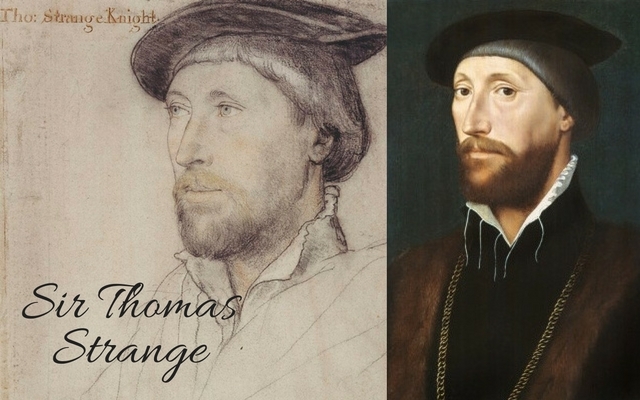 Thank you for showing so many Tudor portraits; such a good reference for the period. I have enjoyed these, they bring to life people who are long dead, thank you!